The growth represents an increase of 4.8 percent over 2015, the equivalent of about 300,000 more foreign visitors. 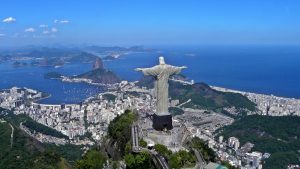 RIO DE JANEIRO, BRAZIL – With the help of the Olympic and Paralympic Games and a stronger U.S. dollar, Brazil increased the number of foreign tourist entering the country to a record number of 6.6 million international visitors in 2016, according to figures released by the Ministry of Tourism. According to a new study of Brazil’s 27 capital cities, Rio de Janeiro was the eighth best for quality of life, photo by Artyom Sharbatyan/Wikimedia Creative Commons License. The record represents an increase of 4.8 percent over 2015, the equivalent of about 300,000 more foreign visitors. In total, foreign tourist injected US$6.2 billion into the national economy, the equivalent to more than R$21 billion. The amount is 6.2 percent higher than the US$5.84 billion spent in 2015. Despite the record volume of foreign tourists in the 2016 Olympic year, Brazil is still far from the main tourist destinations in the world. For example, Brazil does not receive even ten percent of the volume of tourists from France, leader in the ranking of the World Tourism Organization, which in 2015 received 84.5 million visitors. According to a report by Brazilian news outlet G1, Brazil leads in number of foreign visitors in South America, but followed closely by Argentina, which in 2015 received 5.7 million tourists, according to the World Tourism Organization. In that year, Chile received 4.4 million and, Peru, 3.2 million visitors from other countries. Tourism Minister Marx Beltrão said said, “I’m not satisfied with the number. I am working for Brazil to receive more tourists,” adding that by 2017, the target is to increase the number of foreign tourists by at least five percent. In order to fulfill the goal, the minister defended the simplification of the process of granting visas and the opening of foreign capital to airlines. “It is time for Brazil to facilitate the visa issue for the [tourists of] the United States, Canada and Australia, for example. There is no reason to disrupt the arrival of these tourists to Brazil. North American tourists are going to Argentina because they do not need a visa,” he said. The 2016 record represents an increase of 4.8 percent over 2015, the equivalent of about 300,000 more foreign visitors, photo internet recreation. England, the last country to host the Olympic and Paralympic Games mega-events, grew by 0.92 percent from 2011 to 2012. In following years, the average increase was five percent a year. “We still have a lot to do to efficiently take advantage of the Games’ legacy,” said the minister. Another factor certainly helping draw foreign tourism is the stronger U.S. dollar to the Brazilian real, as in 2010 real (BRL) had soared to an annual exchange rate of R$1.66/US$1. While in 2015 the exchange was at its lowest for the real in ten years, in 2016 it held near R$3.50-3.30/US$1. According to the ministry, half of the foreigners who landed in Brazil have leisure as their main reason for travel, stay in hotels, flats or inns and travel as family or couple. Forty percent of tourists use the internet as their primary source of information. Good Luck with increasing tourism. The average cost of non-stop roundtrip airfare from the US to Brazil (>$1,400 USD) is not considered affordable for the average working American. Why visit Brazil when a vacation to Spain, Paris, Bangkok, the Caribbean, etc. could be found for less. I couldn’t agree more with safety being a main issue. Brazil needs to do something to cut down on robbery and put more police on the streets. People do not want to spend all this money to not feel like they are secure.